Asia’s biggest music awards ‘2018 MAMA (Mnet Asian Music Awards)’ organized by CJ E&M completed its long journey in Korea, Japan and Hong Kong from December 10 to 14. Kicking off with ‘2018 MAMA PREMIERE in KOREA’ on the 10th (Monday) by new Korean and Asian artists, the event proceeded with the ‘2018 MAMA FANS’ CHOICE in JAPAN‘ on the 12th (Wednesday) with artists strongly supported by fans worldwide, followed by ‘2018 MAMA in HONG KONG’ on the 14th (Friday) that was a dream performance by the outstanding artists of the year beyond generations and genres, sharing a great musical bond with fans all over the world. 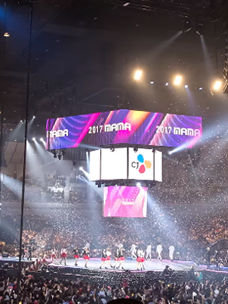 ▲Panorama of 2018 MAMA FANS CHOICE in JAPAN. The ‘2018 MAMA’ was broadcasted live on Mnet and major local channels of Asia and also aired online such as Mwave, YouTube, Naver TV and V Live to over 200 regions worldwide for all global music fans to see, receiving a fervent response. The ‘2018 MAMA FANS’ CHOICE in JAPAN’ featuring real-time voting on social media recorded 13.35 million votes in over 40 regions worldwide such as the US, Japan, Germany and Australia during the ceremony, also becoming ranked No. 1 in Real Time Trends on Twitter. Moreover, over 32 million people watched MAMA from live broadcasting online in three regions. It is amazing that a single awards ceremony was able to create a frenzy on multiple continents at once. ▲BTS won Artist of the Year at 2018 MAMA in HONG KONG. ▲Wanna One performing at 2018 MAMA FANS CHOICE in JAPAN. 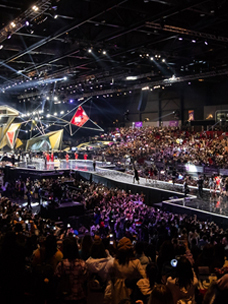 A total of 40,000 fans flocked to the ceremony of MAMA. The venue was packed with not only the audience for the event but also fans who did not have tickets but still wanted to enjoy the atmosphere of MAMA. For fans all over the world, MAMA is already resonating as a global music awards festival for everyone to enjoy regardless of country or culture. ▲A red carpet photo of Mamamoo who put on a stellar performance at 2018 MAMA FANS CHOICE in JAPAN. ▲Pop legend Janet Jackson received the ‘Janet Jackson Inspiration Award’. ▲Angelababy, Chinese actress and model, invited to 2018 MAMA in HONG KONG. The ‘Best New Asian Artist’ category newly established to expand musical exchange within Asia was a meaningful occasion to create harmony among the next-generation leaders of Japan, Greater China, Indonesia, Vietnam and Thailand right in Korea, the home of K-pop. The special collaborations unique to MAMA also captured the fans’ attention. The awards ceremony was filled with distinctive performances that are not likely to be seen in other awards, such as the border-transcending collaboration of Greater China’s popular artist JJ Lin and Hallyu star Kim Jong-kook, the generation-transcending collaboration of hip-hop legends Tiger JK & Yoon Mi-rae, Chunga and Vernon (Seventeen), and genre-transcending collaboration of Momoland and Mommy Son. ▲Wonderful performance by Mommy Son and Momoland at 2018 MAMA in HONG KONG. Even though new awards ceremonies are being created based on the performance of sound sources and record sales, MAMA has always been differentiated from others considering its aspirations for reaching the global market. ▲Girl group Twice won the Song of the Year at 2018 MAMA in HONG KONG. MAMA announced its vision at the press conference for the 10th anniversary of MAMA that “it will become the music awards that embrace both K-pop and Asian music with the greatest influence ever.” As such, MAMA’s ambition is to establish itself as Asia’s best music awards even in the world’s biggest music markets such as North America and Europe, and make Asian music the mainstream of the global music industry. ▲Hosts of 2018 MAMA: actor Song Joong-ki, Park Bo-gum, and Jung Hae-in. The last 10 years of MAMA have been the time to realize its image as the leader based on countless undertakings as well as evolutions and developments. The next 10 years will be to secure its place as Asia’s best music awards standing on par with global awards. MAMA is celebrating its 10th anniversary this year as the global music awards created by CJ based on its sheer will and continued efforts about the culture business. Since starting out as the 1999 Mnet Video Music Awards, it has been constantly evolving along with the growth of the Korean music industry and held in Korea for over 10 years before transforming into ‘MAMA’ in 2009. It made its first global expansion by hosting in Macau in 2010, followed by Singapore, Hong Kong, and as many as three regions (Vietnam, Japan, Hong Kong) last year for the first time. Now it has become the biggest music festival for everyone in the world beyond merely a music awards ceremony at the end of the year, as well as a global communication channel and a venue for expansion of Asian pop music.